I love working with Filo or spelled as Phyllo. 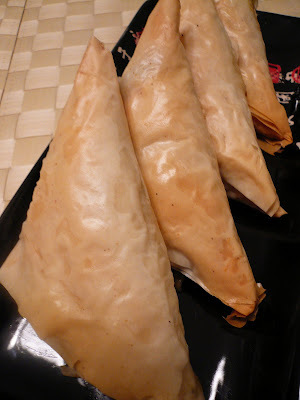 Is a paper-thin pastry dough that is used in many Greek cooking. You can used it for appetizer, main course and even desserts. Is readily available at many supermarkets here. One difficulties working with filo is that it tends to dry out very quickly once its exposed to air. So you have to work really quickly with or or always cover it with a damp cloth. This will prevent the sheets from drying out. 1) Mix all the filling ingredients in a mixing bowl and set aside. 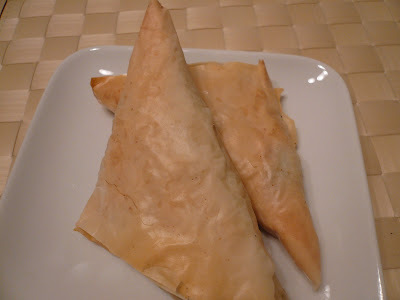 2) Lay down your first sheet of filo, brush sparingly with butter and layer the next sheet on top. Do a total of 4 sheets. 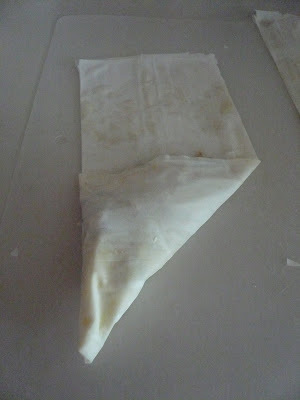 3) Divide/cut the filo into 4 strips. 5) Do the same with the rest of the pastry. 6) Brush with some butter and place on a baking tray and bake in a pre-heated 350 degree F oven for 20 min or until golden brown. Note : Don't be afraid of filo and don't worry if you make mistake the first time round. It will get better with practice. Sedapnya your filling tu. Chicken and cheese must be yummy!The first time I've got to know Phyllo was when my friend make baklava. But I have never buy it. Phyllo is quite pricy for me. $10 for a packet of 10 sheets? Ah, it does look like spring roll skin... Chrispy.. Chicken cheese fillings sound really good, Gert. i always use phyllo to make strudels. Pearly, this Phyllo is very much thinner than the Chinese popiah skin. You should try it. Zue, yeah they make baklava with phyllo. No lah..I paid only around $2.50 for a box of 24 sheets of phyllo from Wegmans. My ex-boss is Mr Suresh Kumar and i can't remember the company's name. Sorry lah. Old already. I think it's about 14-15 years ago. filo is lovely to work with! I sometimes use it with salmon! or just cinamon and icing sugar or even mix nuts! Diana Choo, is that really you!!!!! 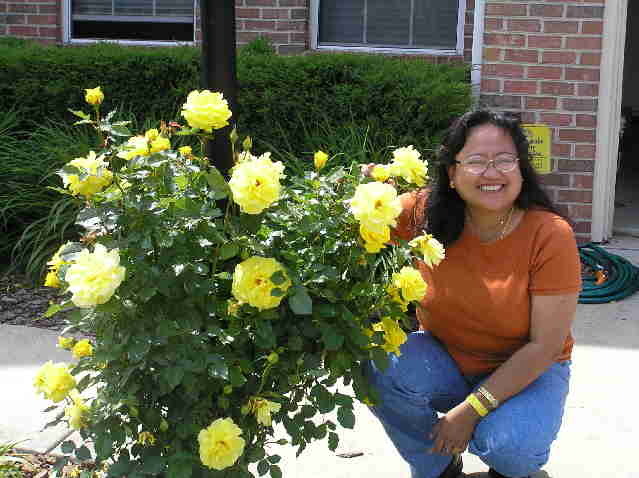 Oh my gosh, how did you find my blog :) :) ??? I'll write to you. BBO, the Greeks like to wrap Salmon with Phyllo. Cinamon and sugar...good idea. Thanks. I used filo once and it was a disaster. Like you say I need more pratice. i bought 2 boxes of filo pastries. there's still 1 3/4 in the freezer. i did some 'nests' with them.. took my time.. and then almost all went dry! and they are very fragile too!! This sounds like a really delicate recipe requiring expert fingers and techniques, one that I should just admire and drool over. Fortunately, I am not a fan of flaky pastry, so much suffering involved. LOl! Oooops! I meant to say 'not' much suffering involved. Zaza, you really have to work fast with filo and make sure you cover it with a damp cloth or paper towel.